Mobile hardness testing is on the advance: In these times of cost pressures and higher quality requirements there is a quick and economical supplement to stationary hardness testing in the modern production process. The application possibilities are far ranging, this includes large parts as well as small parts, and especially applies to positions which are difficult to access. There are two different physical methods which are particularly recognized in the practical field: the statical UCI method and dynamic rebound hardness testing. The decision as to which method is used mainly depends on the test task. The article explains the basic principles of both test methods and compares, using examples from the practical field (e.g. hardness testing in the heat affected zone of welds), the application possibilities of both methods. In addition to this, the subjects critically discussed are the factors of influence for hardness testing, such as surface preparation or the wall thickness of parts to be tested, e.g. pipelines. Fig.1: Hardness testing with aUCI instrument on the tooth flanks of a pinion shaft. Fig.2: Hardness testing with a rebound tester on the drive wheel of a large hydraulic digger. As in Vickers or Brinell hardness testing, the question as to the size of the test indentation in the material generated by a certain test load also arises in the Vickers hardness testing according to the UCI (Ultrasonic Contact Impedance) method. However, the diagonals of the test indentation are not determined optically for the hardness value as usual, but the indentation area is electronically detected by measuring the shift of an ultrasonic frequency. This can be illustrated by a small imaginary experiment. A UCI probe typically consists of a Vickers diamond attached to the end of a metal rod (Fig. 3). This rod is excited into a longitudinal oscillation of 70 kHz by piezoelectric transducers. On the other hand, instead of the metal rod (we refer to it as oscillation rod) imagine a large spiral spring which is held at the end and oscillates at a zero frequency of 70 kHz at the free end (Fig. 4). Fig.3: Schematic description of the UCI T = Piezo Transducer, R = Receiver, O= Oscillating rod, V = Vickers diamond, m = material. Fig.4: UCI principle in an imaginary experiment: an oscillating spring in contact with material. The spring symbolizes the oscillating rod, the contact plate symbolizes the diamond, the material springs symbolize the material and its elastic constants. At the tip of this spring there is a triangular contact plate, the Vickers diamond. The test material in contact with the Vickers diamond can also be imagined as a system of smaller spiral springs positioned vertically to the surface - an atomic bonding, two atoms interlinked via a "spring". If just one of these "atomic springs" is touched by the Vickers diamond in this imaginary experiment - like very hard material into which the diamond can only slightly penetrate and thus generates a small indentation - an additional spring, i.e. mass, is coupled to the large spiral spring. There is then a shift in its zero frequency due to this additional mass. This frequency shift becomes larger if other "springs" are touched, that means if the diamond penetrates deeper with a material showing medium hardness, and the test indentation becomes larger. Analogously, the frequency shift is at its largest with soft test materials; the diamond penetrates deep into the material and leaves a large indentation. This is the secret of UCI hardness testing: the frequency shift is proportional to the size of the test indentation generated by the Vickers diamond. Equation (1) describes this basic relation in comparison to the definition of the Vickers hardness value. 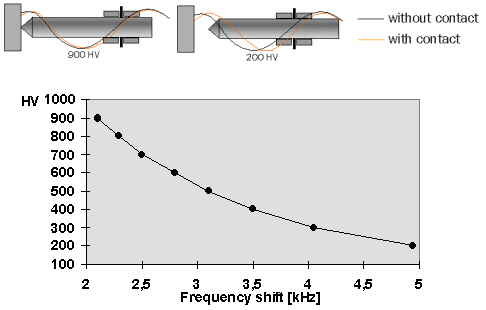 Fig.5: Hardness value versus frequency shift of the oscillating rod. Equation 1: Frequency shift proportional to indentation size of a Vickers indentor. Df = frequency shift, A = area of indentation, Eelast = Young's modulus, HV = Vickers hardness value, F= Force applied in the Vickers hardness test [1,2]. The frequency shift nevertheless also depends on the Young's modulus of elasticity. After completing the calibration, the UCI method can therefore be used for all materials showing this modulus of elasticity. The probes are factory-calibrated to low-alloy or unalloyed steels; however, modern test instruments can be quickly calibrated on site for other materials as well, such as titanium or copper. Fig.6: The basic principle of the rebound hardness test . Hardness testers using Leeb's method operate in a slightly different manner. Although the size of the test indentation generated is connected with the material hardness even in this case, it is indirectly measured via the loss of energy of a so-called impact body. Fig. 6 illustrates the physical principle of measurement. A mass is accelerated to the surface of the test object and impinges on it at a defined speed, i.e. kinetic energy. The impact creates a plastic deformation of the surface, i.e. an indentation, due to which the impact body loses part of its original speed - or energy. It will lose more speed by creating a bigger indentation and, thus, at softer material. Technically, this principle of measurement is implemented by means of an impact body which has a spherical tungsten carbide tip and which is fired onto the test surface by spring force. The speeds after and before the impact are each measured in a non-contact mode. This is done by a small permanent magnet within the impact body (Fig. 7) which generates an induction voltage during its passage through a coil, with this voltage being proportional to the speed (Fig. 8). shown before and after the impact . VI, VR = Speed before the impact / after the impact. You might asked yourself: "Who wants to measure the hardness value in Leeb?". The answer is: as a matter of fact, anybody who uses the rebound hardness testing method does it because the Leeb hardness value is, by definition in the equation (2), the actual physical measurement value behind this method. However, no user indicates the Leeb hardness value HL in his specifications or test reports. We mostly convert into the required hardness scales (HV, HB, HS, HRC, HRB, N/mm2). For this reason, only conversion brings the rebound hardness method to life. Therefore, conversion tables, like in Fig. 9, are stored in all instruments. Fig.9: Conversion of Hardness Leeb, HL, into HRC as a typical example for conversion tabless stored in rebound hardness testers. These curves are experimentally generated by material samples of different hardness measured by rebound and rockwell test. The UCI method is recommended for testing fine grained material having any shape and size. It is especially used where material properties are to be processed with narrow tolerances, e.g. for determination of strain hardening on drop forged parts. Rebound hardness testing is carried out on large, coarse grained materials, forged parts and all types of casted materials because the spherical tip of the impact device produces a rather larger indent than the Vickers diamond and therefore processes the characteristics of the casting structure better. 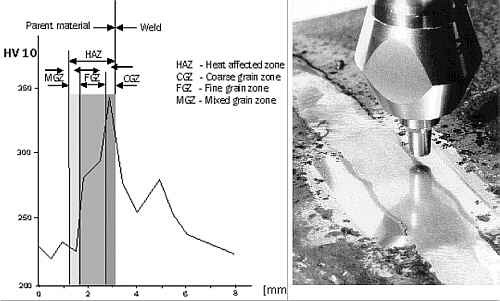 With the small indent of the Microdur UCI probes, determination of the hardness can be made on welded parts in the critical area of the weld, the heat affected zone (HAZ). A number of probes and impact devices having different test loads open up different areas of application. Table 1: Applications for UCI and rebound hardness testing. Fig. 10: Schematic indentation width created by a "D" impact device having a 3 mm tungsten carbide ball (e.g. Krautkrämer Dyna D or Equotip D) in comparison to different Vickers test loads of UCI probes, i.e. 98 N, 50 N (=5 kp) and 10 N (from left to right). In general, the larger the area sampled by an indentation the more consistent the test results. The variations in microstructure of non-homogeneous materials or those comprised of large coarse grains are averaged out and consistent hardness values can be achieved. Also a larger indentation puts fewer demands on the surface finish and requires less surface preparation. In comparison, the indentations yielded by the various impact devices of rebound testers are much larger than those created by any UCI probe. When testing large castings and forgings the rebound tester is recommended. Testing small homogenous materials that are surface hardened require the shallower indentations produced by UCI probes. Tables 2 are provided to compare the indentation size of rebound impact devices and UCI probes at three levels of hardness. Table 2: Approximate indentation width (m) at different hardness levels. Hardness testing on welded parts is another excellent example of showing the importance of the indentation size. Hardness measurements , especially in the HAZ determine whether the welding was done properly. For example, high martensite content in the HAZ very often causes cracks at the weld. A high hardness peak in the HAZ, therefore, gives a good indication. Of course, only those techniques can be used which just measure this critical area. Fig. 12 shows that just the HV5 and the HV10 indentation are located within the critical area of 0.2-0.3 mm. HV20, HB1 and the rebound indentation are outside this zone resulting in a lower hardness value due to their overlapping with zones of lower hardness. The big circle shown in Fig. 12 indicates the size of the Poldi-Hammer, which is still very often used to check welds on pipes etc. Obviously, it will give a low hardness value, which means no further heat treatment of the weld will be necessary. Whether this was a wise decision or not must be left to the opinion of the reader. Fig. 11: Critical area of HAZ, schematically (left) and prepared for testing on a tube used in the offshore industry (right). Fig. 13: Standard Vickers values (HV10) compared with rebound values (HVR) for different wall thickness of tubes . Wall thickness of tubes, pipelines or valves are critical for portable hardness testing. The test objects minimum mass is indicated for the rebound method which should not exceed 2.5 kg (Impact Device D). But the wall thickness also plays an important part in selection of the test method. It can influence the hardness value even when the test object is solid and weights a few tons. Despite the impact devices small mass and the low impact energy, there is a high force of about 900 N produced at the time of impact (as a comparison: the maximum force of a MIC UCI probe is 98 N). That is sufficient to produce vibrations, the same as the skin of a drum, with a wall thickness of under 20 mm - which can cause smaller hardness values and large amounts of scatter. In such cases, preference should be given to the UCI method. 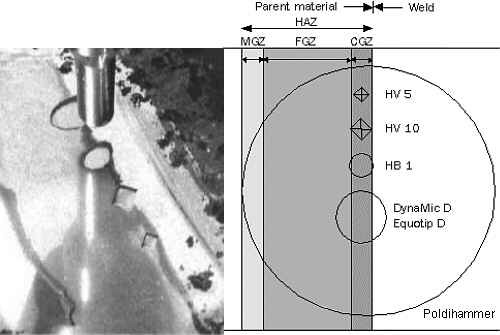 Fig.13 shows the hardness values measured by a standard Vickers test with a 10 kp (98 N) force and those values measured by a Dyna D impact device. For a wall thickness higher than 20 mm, both tests show the same results. Below 20 mm, the Vickers value measured by the rebound test is lower than the true value resulting in a deviation from the horizontal line. Table 3: Recommended minimum wall thickness. allowing measurement of lower wall thickness. All hardness testing methods require smooth surfaces free of oxide scale, paint, lubricants, oil, plastic coating due to corrosion protection or metal coating for better conductivity. The indentation depth should be large in comparison to the surface roughness. Table 4 provides the recommended minimal surface roughness for available rebound impact devices and UCI probes. If surface preparation is necessary, care must be taken not to alter the surface hardness by overheating or cold working. These values are based on values given in the specific hardness testing standards. More practical results can be achieved by using a battery driven, high speed (>12000 rpm) handheld grinder. Use 180 grid to get a smooth surface. It takes just 10 seconds. Table 4: Maximum surface finish according to the Vickers standard. Fig. 14: Hardness versus surface preparation. HVR indicates converted Vickers hardness values measured by rebound hardness testing. Kleesattel, C., Gladwell, G.M.L. : The Contact-Impedance Meter, Ultrasonics 6 (1968), 175-180 and 244-251. Kleesattel, C.: Das UCI Härteprüfverfahren, Krautkrämer Sonderdruck, Echo 27. Leeb, D.: Definition of the hardness value "L" in the Equotip dynamic measurement method. VDI Berichte 583 (1986), 109-133. Haas, R.: Erfahrungen mit einem mobilem Rückprall-Härteprüfgerät, Ambulante Härteprüfung am Bauteil, Lehrgangsunterlagen, Schweißtechnische Lehr-und Versuchsanstalt.